We are migrating Sitecore 7 instances to Sitecore 8 and we currently have the following scenario in production. 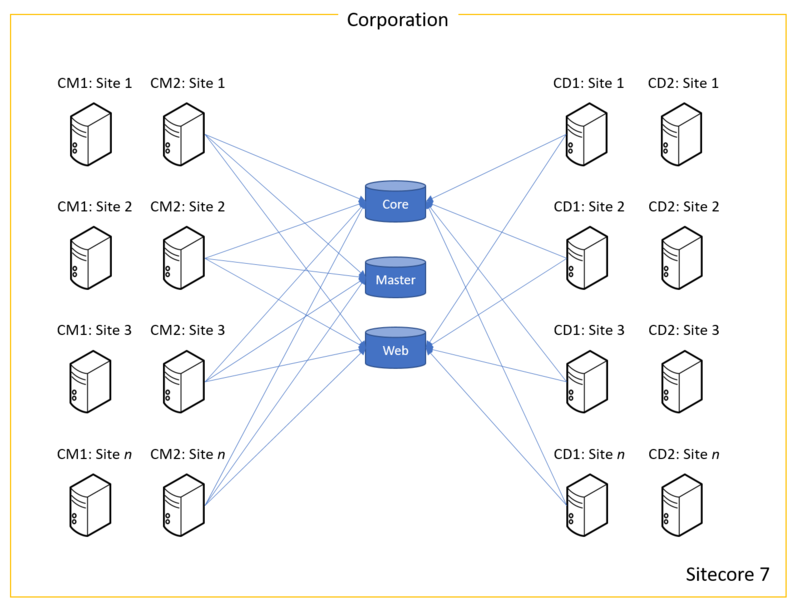 Different sites with two separate CMs and CDs (failover) each using the same databases (Core, Master, Web). Each site has its own solution and use different assemblies which are conflicting between sites. So that's why they are hosted in separated CM servers. Also, they are under different domains (e.g. site1.nl, site2.nl) and therefore don't share the same session. Our client wants to start using xDB and leverage data collect from different sites. e.g. personalize content in Site 1 based on interactions done in Site 2. We were wondering if keeping this same architecture would enable the users to use xDB features across multiple sites. If not, could you please point us to a best alternative? This information has just arrived. All the sites are under the same domain. They use different subdomains, though. e.g. coffee.gohorse.nl, ontdek.gohorse.nl and etc. So I believe we won't need to implement custom code to share the session between the sites. I've noticed that Sitecore 7 creates 1 cookie named SC_ANALYTICS_SESSION_COOKIE and another named SC_ANALYTICS_GLOBAL_COOKIE. The cookie value SC_ANALYTICS_SESSION_COOKIE changes per subdomain, but the SC_ANALYTICS_GLOBAL_COOKIE remains the same (and expires 10 years from now). We are planning to use an out of process session management with Redis in Sitecore. That being said, I want to know if personalization with xDb data across multiple sites would be possible? I don't know the way how to do it out of the box. But can suggest how to do it with hack. Idea is to sync cookies that Sitecore uses to identify visitor to same values across all websites. (Important requirement is that analytics DB and Sessions store should be shared between all sites). When these cookies will be same, Sitecore would think that it is the same visitor. You can add bunch of invisible service iframes that will set ASP.NET_SessionId, SC_ANALYTICS_GLOBAL_COOKIE and SC_ANALYTICS_SESSION_COOKIE to same values for all your websites. No needs to create custom solution described above. João, Anton's solution is the kind of SSO-like that I told you during the hackathon. Despite being very unusual to have SC instances sharing the same database but having different DLLs, I believe you will be able to setup all instances to point to the same xDB (mongo), then all sites will start to track down accesses individually. Later, if you want to use the analytics data from one site into the another, you will need some kind of backward identification - either by using the hack that Anton described, or doing the same form identification method that we used at the hackathon. Just pay attention that OOTB you must have 1 and only 1 processing server, you still can scale it, but by default only 1 is allowed. How to achieve different field values based on environment?